Two simple steps to fire. with left mouse button, select the unit you want to fire with. within the red circle surrounding the selected unit, place the cursor on the chosen target and click the right mouse button. 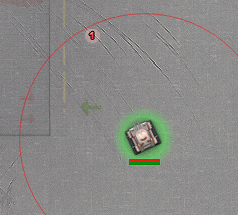 Your unit can fire only within its firing range, it's a red circle around selected unit. Some of the vehicles have two firing ranges, in that case you can only fire in between them. After the fire command, a small red circle with the number one will appear on the location where the fire command is given. This number one indicate that the selected unit will fire one time at this location. You can cancel the fire command by clicking at this number with the left mouse button. Fire at multiple targets and unlimited fire. By clicking the fire command again with right mouse button, you will create unlimited fire to this location, and the number of the command will be changed to the sign of infinity. Infinite fire can be canceled like all firing commands. 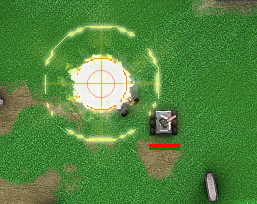 Within the firing radius of one selected unit, you can attack multiple targets by giving more then one fire command. In that case, the number on the fire location will indicate the firing sequence. Fire command will always cancel the move commands of the selected unit, in "Basic Controls" default game controls. Another important thing you should know before you give fire orders to your battle unit, is your unit weapon reloading time. At the beginning of the battle, all your units will be fully reloaded and ready to fire, but after the first fire commands, their weapons have to be reloaded again. Reloading is automatic and a increasing red line under your unit will remind you about the time left before a unit is ready to fire again. Pay attention: different units have different reloading times. To see your weapons reloading times before the battle go to Hangar and select one of your constructed units, weapon reloading time, like other weapon information located in the vehicle turret information box. Weapon reloading time of the turret can be affected by turret upgrades and driver's reaction speed. The greater driver's reaction, the less time is needed for reloading. 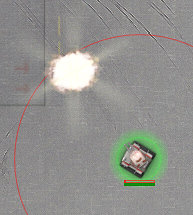 Did you know that: Driver's reaction speed increases turret rotation speed of the unit he is driving. 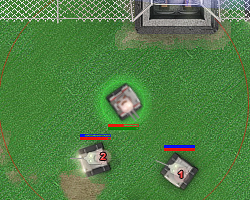 Rotation speed of the turret can be very critical in the battle, especially for the artillery. There are two types of weapons, Direct and Indirect. Indirect weapons can shoot over the obstacles, however, most of the time, they have greater reloading times then direct weapons, and sometimes have close non-firing range. Did you know that: Fire range can be increased by turret upgrades "Terrasys Navigation" or driver's accuracy skill. Most of the weapons have explosion radius. Artillery units usually have greater explosion radius then Assault, Dominator or Scout units. The damage to the unit within the explosion radius, depends on her distance from the center of the explosion. i.e. in the center of the explosion, the vehicle will take the most severe damage then the other vehicles in the explosion radius. If Direct fire weapon hit the target by the direct impact, the target will suffer from maximum damage, and no damage will be done to any of the units within the explosion range. However, In-Direct hit (arc, from top) always have explosion radius, and any unit within its explosion range will take damage. Firepower can be increased by ammunition upgrades, and by driver's accuracy skill.